Earlier this month, I was featured on the American Society of Plastic Surgeons (ASPS) blog. 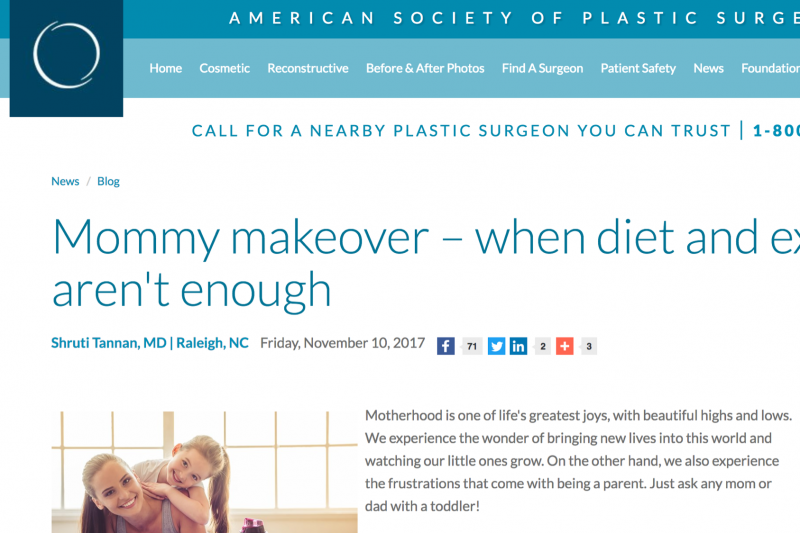 For those who don’t know, ASPS is a membership organization that represents the vast majority of board-certified plastic surgeons in the U.S. My Mommy Makeover post on ASPS was titled “Mommy makeover – when diet and exercise aren’t enough“. As moms, our bodies change in a variety of ways from pregnancy, childbirth and breastfeeding. For example, our bodies store more fat. Our breasts deflate and sag. Our abdominal muscles can stretch and separate. Sometimes even the best diet and exercise routines aren’t enough to bring us back to our pre-pregnancy shape. Thankfully, we can consider a Mommy Makeover, a combination of different plastic surgery procedures like tummy tuck, breast lift and liposuction, to help us on this journey. The interplay of motherhood, beauty and health rings home for me as a mother of two. Because of this, I can truly understand what you might be feeling as a mom. It is my privilege to care for other moms in Raleigh, Cary, Chapel Hill, Durham, Clayton, Garner, Wake Forest and other areas around the Triangle of NC. Check out the Mommy Makeover post on ASPS here and scroll down for helpful resources to learn more about Mommy Makeovers! Resource: $500 OFF Mommy Makeover – for a limited time only!